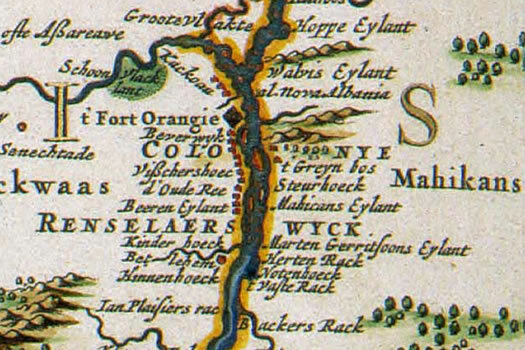 From a circa 1684 map of what was then called New Netherland. That article about a possible shark in Lake Ontario reminded us about a story we once heard about whales swimming up the Hudson River to Albany. Just another fish (er, cetacean) story, you say? Or, at least, it's true according to historical accounts. And they're very old accounts -- from more than 350 years ago. On the 29th of March in the year 1647 a certain fish appeared before us here in the colony[*], which we estimated to be of a considerable size. He came from below and swam past us a certain distance up to the sand bars and came back towards evening, going down past us again. He was snow-white, without fins, round of body, and blew water up out of his head, just like whales or tunas. It seemed very strange to us because there are many sand bars between us and Manhattan, and also because it was snow-white, such as no one among us has ever seen; especially, I say, because it covered a distance of 20 [Dutch] miles of fresh water in contrast to salt water, which is its element. Only God knows what it means. But it is certain, that I and most all of the inhabitants [watched] it with great amazement. On the same evening that this fish appeared before us, we had the first thunder and lightning of the year. On the 19th of April in the year 1647 another fish appeared here around noon before Fort Orange with the high water (seafaring men who have sailed to Greenland judged it to be a whale). It was of considerable size as the previous one (we estimated it to be over 40 feet long). It was brown in color like a [ ] with large fins on its back and blew water out of its head like the one before. He swam upstream against this extraordinary current. It seemed strange to me because it has been several years since a tuna has appeared here. It caused great amazement how the fish had swum so far and [ ] in this spring two such large fish should appear, [ ] is unheard of, for reasons stated about the previous fish. The public astonishment had scarcely subsided, when another monster of the deep, estimated at forty feet in length, was seen, of a brown color, having fins on his back, and ejecting water in like manner, high in the air. Some seafaring people, "who had been to Greenland," now pronounced the strange visiter a whale. Intelligence was shortly after received that it had grounded on an island at the mouth of the Mohawk, and the people turned out in numbers to secure the prize, which was, forthwith, subjected to the process of roasting, in order to extract its oil. Though large quantities were obtained, yet so great was the mass of blubber, the river was covered with grease for three weeks afterwards, and the air infected to such a degree with the stench, as the fish lay rotting on the strand, that the smell was perceptibly offensive for two (Dutch) miles to leeward. So what caused two whales to venture up the Hudson River in such short succession that year? Well, we'll probably never know for sure. But coincidental to the whale appearances that spring was flooding along the Hudson River due to heavy snowmelt from the previous winter, which accounts report was very long. De Hooges mentions that the flooding was so great that it threatened to displace Fort Orange. And another account, A Description of New Netherland by Adriaen van der Donck, mentions that the North River (as the Hudson was then called) was fresh water all the way to sea that spring because of the snowmelt. Van der Donck also mentions the first Albany whale was later spotted, temporarily stranded, farther down the river, about 11 or 12 miles from the sea, at a spot where four other whales had also been reported stranded that year. You know, that idea of a "white whale" sounds vaguely familiar... oh, right. As you know, Herman Melville lived in the Albany area as a child and young man during the 1830s. He'd later go on to get experience sailing the seas in the whaling industry. But it doesn't seem unbelievable that a young Melville could have heard the story of the white whale that once visited Albany. "Lark Ontario": an Albanian Slip? Editors: Ha! Yep. Thanks. Fixed. True story. ...And that's how Whale Island got its name, later renamed to Van Schaick Island. Now maybe someone will shed some light on the whale signs all over Hudson, NY? I was told that whales were brought all the way to Hudson to be cut in pieces. Wouldn't it be easier to bring people with knife skills to the whales, rather than the other way around? @s - The reason for coming to Hudson is simple...Vertical Business Integration. A sailing family wanted to find a place where they could have the whales rendered _and_ sell the boats all the supplies they needed. That were raised on farms they owned, etc, etc,etc. I believe the whalers in Hudson moved from the Cape Cod area for a safe harbor as the British were conscripting sailors.